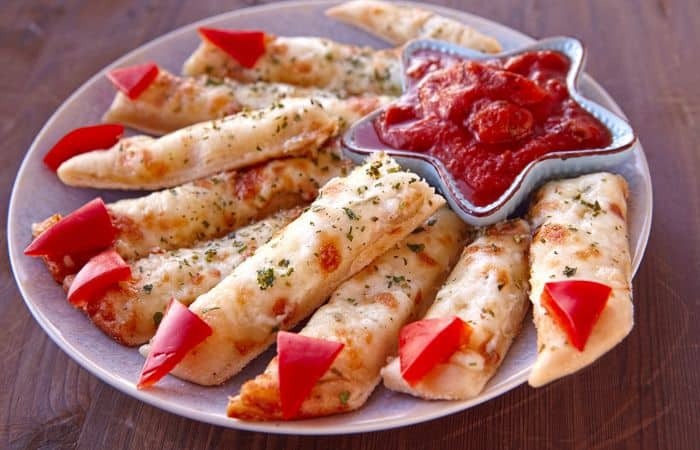 No pizza (even if it’s a pizza with spiders on it) is complete without breadsticks. And, since my family has this awesome tradition of having pizza every Halloween, I decided that, this year, we’re going to do something special and our Spider Pizza is going to have Witch Finger Breadsticks to go with. Easier to make than they seem, these can be made at the same time as your pizza and will make all the kiddos screech in excitement. Now, if only I can come up with some fun spider cupcake to serve afterward…ooooh, stay tuned for next week’s post: Spider Inside Cupcakes…EEP! Cover with a damp paper towel and let stand for 5-10 minutes, depending on how thick you like your breadsticks (I like ’em thick, so 10 minutes it is for me!). While that’s sitting, slice the cherry tomatoes into 10 triangles (or more, if you think you’re going to want more than 10 “fingers”). Pat or roll until it’s a uniform flatness. I like a rectangle-ey shape for my breadsticks (and my baking sheet is rectangle, so sue me). Cover the dough in a thin layer of mozzarella cheese. Sprinkle garlic powder, basil, and oregano over the whole of the dough. Place in the oven and bake for 12-17 minutes or until the cheese is completely melted and edges are browned the way you like it. Slice into long, finger-like sticks. Place a tomato triangle on the end of each breadstick. I serve this with some pizza sauce on the side. For a fantastic recipe, check this out. 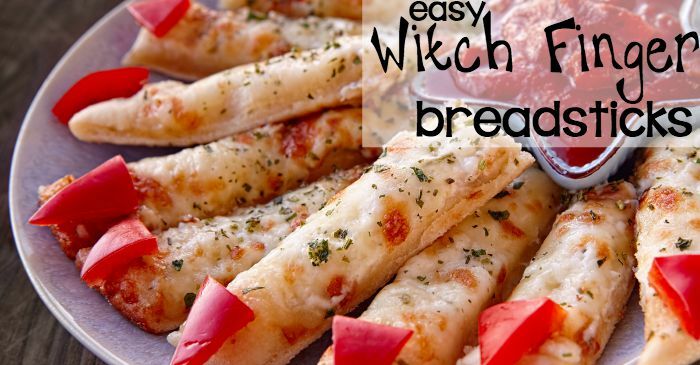 Witch Finger Breadsticks. 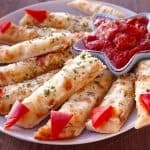 Easier to make than they seem, these can be made at the same time as your pizza and will make all the kiddos screech in excitement.